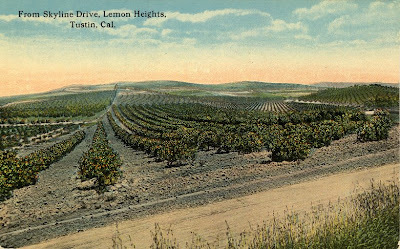 Today's image is an early postcard showing a glimpse of the citrus groves of Orange County. On a related note, there was a story in Thursday's Register about an Irvine developer who plans to wipe out the last grove of any notable size in Santa Ana (along with an adjacent 1914 bungalow). The Bowers Blog is featuring a look at William S. "Laughing Bill" Nickols (1862-1940) of Santa Ana. Their photo of Nickols was taken by noted local photographer Edward E. Cochems (1874-1935). Werner Weiss of Yesterland has put together a retrospective on the Hollywood-Maxwell "Wizard of Bras" exhibit/shop that was an early feature at Disneyland. It's a good recap of one of Disneyland's least likely attractions. The Nixon Library Foundation has posted a brief essay on their website entitled, "Richard Nixon's Birthplace: I lived there, too!" by Linda Waldron Bugbee. It's interesting to see this O.C. landmark (and old Yorba Linda) through another set of eyes. I enjoyed that little article about the Nixon birthplace house. Very interesting!